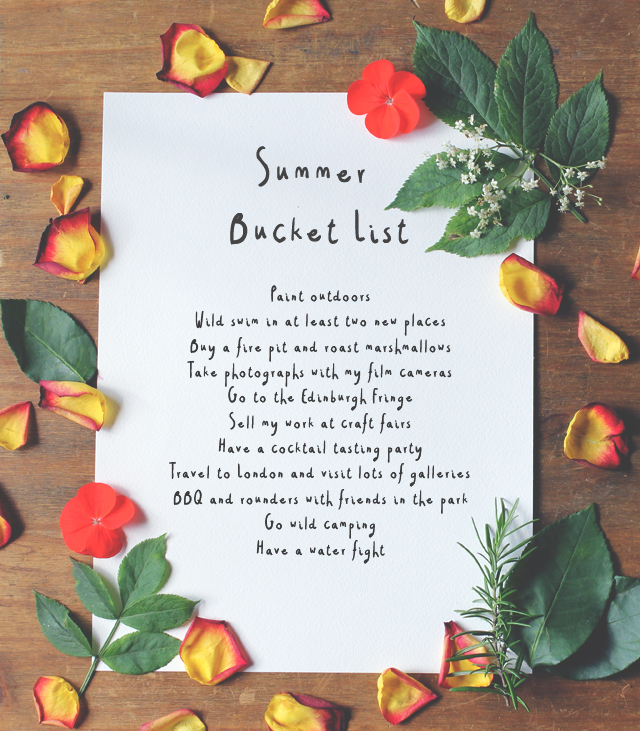 I have seen a few bucket lists on other people's blogs before, so in time with the beginning of summer, I thought I'd try my hand at one. Unsurprisingly it was rather enjoyable thinking of all the fun and exciting things that I'd love to achieve this summer and I'm now itching to get started crossing them off my list! - I haven't properly painted outside in years. I want to go somewhere beautiful, armed with my easel, paints, brushes and a canvas and get lost in the peace of painting. - As I have mentioned many times before, I have a slight obsession with wild swimming. I went back to the same place a few times last year, mainly because I knew it was good for a decent swim. I want to be more adventurous this summer. - I'd love to spend more time in our garden in the evenings. A lovely and delicious way to end a long summer's day. - I have used them a few times, but I really want to try to learn to use them properly. I think it would be really special to have an album of film photographs from this summer. - Something I've always wanted to go to, plus my brother is performing again this year. No excuses this time! - I cheated with this one a little bit as I already know I'm going to be selling at some fairs, but I can't be alone in only writing something down to cross it off straight away?! I can't wait to see what fairs are like from the perspective of a seller and to meet new creative people. - I love cocktails, that much is obvious. I'd love to have my friends round, each of us brings a different drink and then let the experimenting commence! - I haven't been to London in ages, mainly because it stresses me out, but I really want to see some new illustration and design to get inspired. - Simply because how much fun would that be?? - I'd love to camp in the middle of nowhere, watch the wildlife, hike and do some amazing stargazing. Kyle and I have been trying to achieve this for the past two years now, third year is the charm? - Pretty self-explanitory, they're hilarious! Now I really am over excited! Do you have anything different from usual that you'd love to achieve this year? I'm putting together a small summer bucket list too. Wild swimming is definitely something I'd like to try but I'm a bit of a scardey about this silly British weather. My fiancé loves to wild camp! Have you read Pheobe Smith's Extreme Sleeps? Totally inspired me to wild camp, she goes on some awesome adventures and I think she's currently working on her second book!